On Monday, we posted Part 1 of our exclusive interview with Tom Felton, touching on his experiences filming Murder In The First. For Part 2, he chats about his upcoming projects, his recent visit to Diagon Alley, and starting a Boy Band with Dan and Rupert? Enjoy!!! Feltbeats: What’s next on your schedule? Tom: Heading off to work on a new feature film with Joseph Fiennes called “Clavius” for the next few months which I’m very excited about! Feltbeats: Many HP stars play an instument or sing, would he ever like to record a song as an ensemble for the fans? Tom: I’ve tried several times to start a pop group with Daniel and Rupert with little success. Never say never. Feltbeats: What do you think of the success of Belle? The Reviews are fantastic! Tom: I was so happy it got the response it did. It has such a relevant message today and I’m thrilled Amma is getting the credit she deserves, I’d jump at the chance to work with her again. Feltbeats: You recently attended the preview of Universal Orlando. What did you think of Diagon Alley? Tom: Unbelievable. They really have raised the bar. Feltbeats: We would most likely find Draco Malfoy down in Knockturn Alley. Where would Tom Felton hang out? Tom: Whichever place was dog friendly. The three broomsticks, they do great food…! Feltbeats: If you were jonesing for a Harry Potter fix, where would you rather be? Studio tour or Wizarding World of Harry Potter? Tom: Both work differently. The studio tour is home and the park is pure escapism. As always, it would not be a Feltbeats interview without a few silly questions. Stay tuned for Part 3 of our Exclusive interview with Tom Felton on Monday! A little over a week ago, My Son Christopher and I had the pleasure of attending the VIP/Media Preview of The Wizarding World of Harry Potter-Diagon Alley. As we previously reported, Tom Felton was there with numerous Harry Potter castmates to give their take on the latest addition to Universal Orlando. 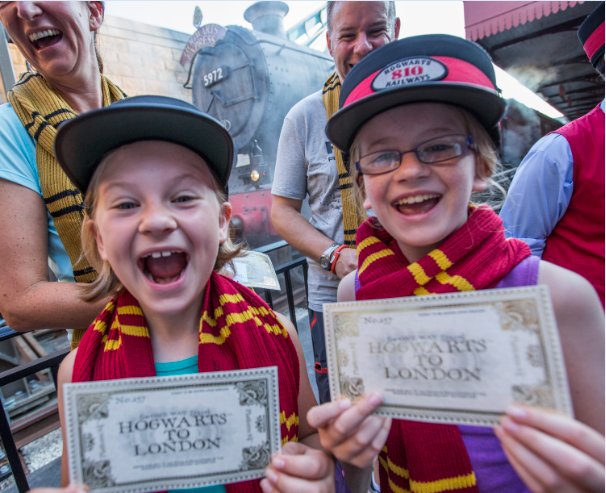 Here is a look into some of the experiences you will see when Diagon Alley officially opens on July 8th. Just like in the first Harry Potter films, you can only reach Diagon Alley one way, by going to Muggle London and knowing where to look. The London Facade that Universal Orlando created is truly spectacular featuring stunning architecture, popular British businesses, and the infamous Knight Bus, complete with their own Stan Shunpike! Be sure to check out this part of the park at night when it’s lit up, for it’s truly magical (pun intended). You will also find 12 Grimmauld Place (be sure to look in the window for creature keeping an eye on everything), as well as the Leaky Cauldron sign that only Wizards can see. It wouldn’t be complete however without the show piece for Muggle London, Kings Cross Station. The Hogwarts Express will take riders from Diagon Alley to the Hogsmeade portion of Islands of Adventure and back. Riders will need a park to park ticket to experience The Hogwarts Express. The train which looks exactly like the one Harry, Ron and Hermione boarded each September 1st is truly an interactive experience. When looking out the window, you will not see Orlando, but a video of the English countryside featuring the Weasley twins, and Hagrid, and is different in both directions. Be sure to check out the tree outside Malfoy Manor on the way back to Diagon Alley ;). You will hear Harry Ron and Hermione multiple times as though they were right outside your carriage, and even encounter dementors on your journey. Now it’s time to travel behind the bricks straight into Diagon Alley. The first thing you notice when you enter is the drop in temperature, as well as the lack of theme park sounds you would normally hear. You are truly immersed in the experience. The many shops that line Diagon Alley and Carkitt Market are a site to behold. You can buy your Quidditch Supplies and team jerseys in Quality Quidditch Supplies. Get the latest toys and jokes in Weasley’s Wizard Wheezes. Exchange your money at the Wizard Money Exchange. Try on robes at Madam Malkins Robes For All Occasions. Buy your Wizard Stationary at Scribbulous. Get a Butterbeer in the Fountain Of Fair Fortune Pub, and get your Wizarding pet in the Magical Menagerie. There are many store fronts as well that will be very familiar from the books.Flourish and Blotts, The Owl Post, and Grindelwald’s to name a few. If you take a left off Diagon Alley, you will see the entrance to Knockturn Alley. It’s dark, creepy, and cold as though it were full of Dementors. One of the coolest shop facades in all of Diagon Alley is down there, the Wizarding Tattoo Shop. There is one store down there that you can actually experience, the infamous Borgin and Burkes. Inside you will find plenty of death eater products to purchase, as well as take a look at the Vanishing Cabinet from Half Blood Prince, and the Hand Of Glory from Chamber Of Secrets. Once you have your fill of Knockturn Alley, be sure to stop for some refreshments. At Eternelle’s Elixir Of Refreshment, you can have potions added to your Gillywater for Euphoria, Fire Protection as well as a host of other concoctions. Visit Florean Fortescue’s Ice Cream Parlor for a taste of what is possibly the greatest concoction on this green earth, Butterbeer Ice Cream. The soft serve treat is as delectable as it sounds, and if you’re a fan of the regular butterbeer, this is a must try! Some of the other flavors include Earl Grey and Lavender, Sticky Toffee Pudding, Clotted Cream, Apple Crumble, Chocolate Raspberry, and Chocolate Chili (which Christopher was not a fan of, but he’s not a spicy person, lol :)). Highlighting the food experience in Diagon Alley comes from eating in The Leaky Cauldron. You feel as though you stepped right into the movie when you enter from the décor, to the cast members waiting on you inside. The food is standard British fare that can only be found in Diagon Alley including: Fish and Chips, Bangers and Mash, Toad In The Hole, Cottage Pie, Fisherman’s Pie, Beef Lamb and Guinness Stew, Ploughman’s Feast, Split Pea Soup, and a Banger’s Pub Style Sandwich. For dessert, you can wet your appetite on Chocolate Potted Cream, Cranachan, and Sticky Toffee Pudding which was a favorite of Christopher’s. I was partial to the Chocolate Potted Cream which reminded me of a chocolate cherry mousse style concoction. You need something to wash it down with, and The Leaky Cauldron has plenty of options. You can order Butterbeer and Pumpkin Juice like in Hogsmeade, but Diagon has a few options that are exclusive for now such as Gilly Water, Tongue Tying Lemon Squash(which is the most delightfully tart lemonade concoction I have ever tried! ), Otter’s Fizzy Orange Juice, Peachtree Fizzing Tea, and Wizards Brew and Dragon Scale which are alcoholic offerings. The most interesting drink I tried was the Fishy Green Ale. It consists of a lightly flavored mint drink with blueberry flavored jelly bubbles in the bottom that explode in your mouth. You must try it to get the true experience. It’s kind of tough to describe but amazing in taste! Once you have had your fill, It’s time to take part in some of the experiences Diagon Alley holds. Universal Orlando added a second Olivander’s Wand Shop to the Wizarding World of Harry Potter which should alleviate some of the wait time in the original Ollivander’s located in Hogsmeade. This one is larger and included the new Interactive wands. Located throughout Diagon Alley and Hogsmeade are medallions in the ground out front of specific shop windows. Mimic the spell on the medallion and something magical happens! Christopher tried out his wand at numerous windows throughout both parks and it really was a cool site to see! For some entertainment, make a stop at the stage in Carkitt Market to see Celestina Warbeck (Molly Weasley’s favorite singer!) and The Banshees perform. Or watch a dramatic rendition of The Tale Of The Three Brothers. The main attraction in Diagon Alley is Gringotts Bank. From the moment you walk into Diagon Alley and see the fire breathing dragon atop the bank it draws you in to see what hidden down in the vaults. Unfortunately due to technical issues we were unable to ride the attraction during our visit, but we were able to experience the stunning Gringotts Lobby with interactive Goblins and beautiful décor, as well as get our pictures taken for our Gringotts ID’s. Universal Orlando was nice enough to put us up in their brand new Cabana Bay Beach Resort which is the first Value Hotel on park property. Although the other hotels are nice (having tried three of the four now) I actually prefer this one. It’s family friendly with suites that sleep six, and lots of activities outside of the park like a 10 lane bowling alley, lazy river, and water slide. We ate breakfast each morning in their food court and the prices were extremely reasonable. This will be my preferred hotel when visiting Universal in the future. 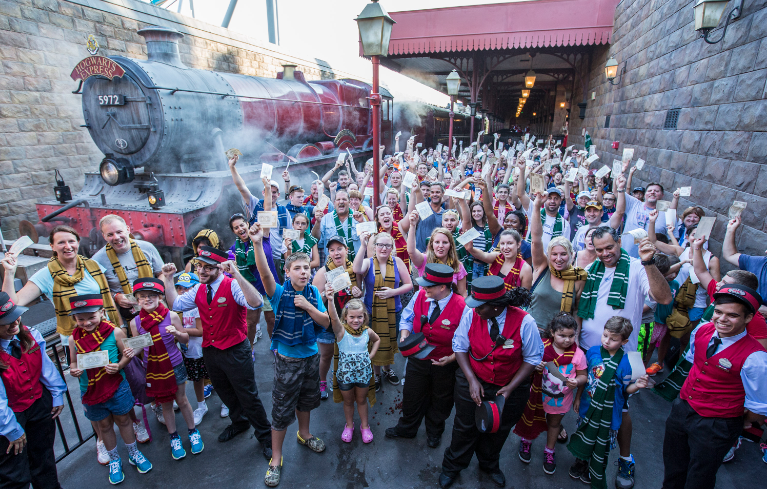 Vacation packages for Wizarding World of Harry Potter are on sale now, and can be purchased here! Grand Opening is July 8th! Thanks to Universal Orlando and their superb Publicity Team for making our visit such a magical experience!! !